Madi Smith threw a 147, and two girls 3,200 relay teams set school records. First a state medal, now a YAIAA record. 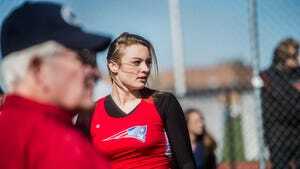 New Oxford junior Madi Smith — who won a PIAA Class AAA javelin silver medal last year after a throw of 135 feet, two inches — picked up right where she left off last postseason by shattering a league record during Friday's YAIAA championships at Dallastown. Smith launched her second throw of the day 147 feet, topping a six-year-old record of 134-9. Up until that throw, Smith hadn't been able to top her throw from last year's state championships all season. The record-breaking throw earned her her first YAIAA first-place medal, and she also medaled in the discus throw with a fourth-place finish. Colonials teammate Ayanna Johnson also earned a first-place medal, winning the 100 dash with a time of 12.45. Bulldogs seniors Bethany Weaver, Nicole Stough and Maddie Miller have been running the 3,200 relay together for four years. In all that time, breaking the school record time of 9:58.63 always seemed like a pipe dream. That is, until junior Erin Chubb joined the relay last month. Suddenly, the record seemed attainable. They nearly broke it last week but missed by 0.2 seconds. Well, that record finally fell Friday as West York ran a 9:50.7 to take first place. 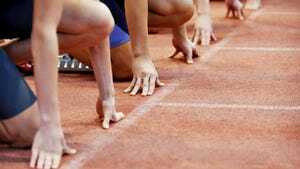 The time puts the relay about three seconds short of the District 3 Class AAA qualifying standard, meaning they could still qualify if not enough teams throughout the district beat the qualifying mark. “Before we went into it, I felt like we could end up in any place as long as we break that record," Miller said. "We also really want to get into districts." Second-place Delone Catholic also set a school record, running a 9:56.49 to break the previous record by more than six seconds. Eastern York sophomore Maddie McLain left last year's YAIAA championships crying after running well below what she knew she could do. She left this year's meet with a big smile and two first-place medals around her neck after winning the 1,600 and 3,200 runs. Her time of 11:30.39 also puts her within six seconds of the District 3 Class AAA qualifying standard. The wins come after McLain placed second in the YAIAA and third in District 3 in cross country this past fall. Her teammate Ashley Kerr won the shot put with a throw of 37-4. Gettysburg sophomore Hannah Baddick made the decision to join the track team on the way back from a gymnastics meet earlier this year. 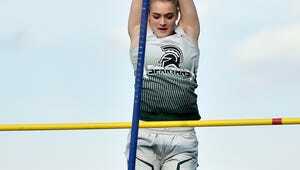 The triple jump quickly proved to be a perfect event for the University of New Hampshire gymnastics commit, and she won the YAIAA title with a leap of 36-3. Her teammate Genesis Mercedes won the high jump with a leap of 5-2.